It is my daily routine to drop by fellow bloggers' blogs...walking through each of their interesting and very inspiring baking repertoires has become very much a part of my daily activities. Although I do not know anyone of them in person, I do feel that I can relate to them very well. I share with them their joy when they churn out a wholesome homemade loaf of bread, I cheered along when anyone of them have conquered and removed the stumbling blocks they faced in their baking journeys, and I totally understand how one would feel whenever I read about a catastrophic event in the kitchen. Occasionally, I came across fellow blogger pals who actually mentioned me in their blog postings :D It warms my heart reading about their kind words and comments. Recently, I read with great amusement when MH mentioned about my pork-floss like chiffon cakes in her post ;') I have never realised that, and after looking through my photos...yes, indeed most of them looked like they were covered with a generous layer of pork floss, lolz! I bought a bottle of Korean Yuzu Tea or Yucheong or Yuja-Cha 柚子茶 jam. This marmalade-like syrup is made from thinly sliced citrus fruit called Yuzu. When mixed with hot water you get a beverage known as Yuja Cha. I like adding lots of ice to turn it to a icy, refreshing cold drink, excellent to quench my thirst during the hot afternoons. I didn't have much luck making chiffon cakes lately. I under-baked my earlier attempt on a coffee chiffon, and upon unmolding, the cake sank like the Titanic, lopsided. After cutting a slice of the cake, the pathetic looking 'ring' reminded me very much of the structure at the Marina Barrage. It was really amazing that even though with the undesirable outcome, we wolf down half of the cake minutes later. Can you spot the dense layer at the bottom of the cake? I can either blame my oven for the unstable temperature, or, it could really be due to the whisking of the egg whites. I may have over beat or under beat the whites? Or could it be due to the folding of the whites to the yolk batter? It's very likely that I deflated the batter quite a fair bit as I kept folding and folding and folding just to get rid of the tiny lumps of whites that were trapped in the batter. Anyway, the cake still tasted good, although the yuzu flavour was not as prominent as I would have expected. The bits of yuzu rinds did enhance the taste though. I will certainly try this recipe again soon...as I am left with less than half a jar of Yuzu syrup! Dissolve yuzu syrup with the hot water. Leave to cool. Place egg yolks in a mixing bowl, add in sugar, and with a manual whisk, whisk till the mixture becomes very sticky and turn pale. Drizzle in the oil, whisking at the same time till the mixture is well combined. Repeat the same with the Yuzu mixture. Sieve over the flour mixture and whisk until flour mixture is fully incorporated into the batter. In a clean, dry mixing bowl, beat egg whites with an electric mixer until mixture becomes frothy and foamy. Beat in the sugar in 3 separate additions on high speed until just before stiff peaks form. Bake in pre-heated oven at 170 degC for 30 ~ 35mins or until the cake surface turns golden brown, and a skewer inserted into the centre comes out clean. Remove from the oven and invert the pan immediately. Let cool completely before unmould. To remove the cake from the pan, run a thin-bladed knife around the inside of the pan and the center core. Release the cake and run the knife along the base of the pan to remove the cake. I would like to try to make Chiffon Cake. But I don't have Chiffon cake tray, Can I use a normal 7"x7" tray to make the chiffon cake? Can you recommend which chiffon cake recipe is the nicest? Other than banana chiffon cake coz I don't like banana cake..
Beautiful baked chiffon cake! I like all your chiffon cake especially the color of the edges is beautiful brown in color. Mmm I love Yuzu Tea too! I think to get a more prominent Yuzu flavour, you can try adding Yuzu juice or yuzu rind. I bought a book called 'Chiffon Cake Book' by Junko Fukada last year, and I've been baking chiffons from there with success - maybe you can try borrowing/buying that book! It's orginally written in Japanese but I have the Chinese translated version...if you'd like to see some of the recipes from that book, they're on my blog. I was taught by my ex baking teacher by this method. I used my hand to fold the batter. It turned out nice. Hi HL, it is best to use a tube pan for baking Chiffon cake. I dont think it will give good results if you were t use a tray. As for which recipe to recommend, I will suggest "Lemon Chiffon Cake" not so much on the taste but rather, I find that this recipe gives better result. Thanks Grace, I have got lots to learn from you, your chiffon cakes are simply gorgeous! Thanks Wendy for the recommendation, I will certainly look for the book. You have a beautiful blog, love your photos! Hi MH, too bad, the rest of my family members also like this cold and refreshing drink! and one bottle is not cheap hor? How I love your pork floss chiffion . I have baked chiffon numerous times but never once getting anywhere near yours. U are very talented. Both your baking skills & photography skills are very good. Just want to share with you that Popular Bookstore are now having some cookbook sales at $5 each..."鮮美果醬輕鬆做" & "菠蘿麵包大集合" are some of the titles U will be interested??? Really worth buying at such price. Cheers. Notice some chinese medical halls sell this tea too. Bigger bottle than those sells at "JL" store. Price not sure, but could be slightly cheaper. SAME SAME! Exactly the same! I baked a marble chiffon cake yesterday and it also had a densed part! Until now, I still dont know why.. Hmm.. I tried this flavour before, it's very subtle. Guess I prefer stronger taste... Good job though! Wow!!! Another lovely chiffon cake recipe from you! I love this!!! 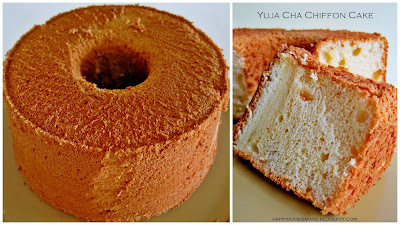 Your chiffon cake has a very nice brown crust on the outer layer which make it look and taste great!!!! I have never been brave enough to bake a chiffon cake - I always envy the beautiful ones they sell at the bakery and dream that one day I will try it - One day, not today! dense layer- ive had that before with a pandan chiffon, and it was definitely the temp of the oven which caused it, as i did not over whip my mixture and the top layer was beautifully soft. I think when your oven isnt the right temp, the mixture sits for a bit as opposed to cooking, and the eggwhites make that dense layer as the air has been squished out by the weight of the mixture. 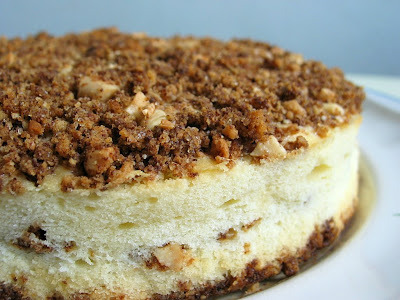 Hi there, am noting that you are as crazy over chiffon cake as myself. The best chiffon cake recipes I have come from the Japanese - as do the best chiffon cake pans. The Japanese recipes are cottony and melt in your mouth... and I don't use any levening agent. The trick lies in the stability of the egg white. MH, I got it from NTUC for just under $10, it's cheaper than those I saw at Korean shops though. Hi Christine, please see Starlight's comments below. It has got to do with the oven temperature. Hope you will be able to avoid this problem in your next bake. Hi Ellena, I think it is because it takes longer for my oven to bake the cake, so maybe that's why the crust turned really brown? Hi Rose & Thorn, I do hope you will give it a try soon! Hi Jane, I use a very thin-bladed knife to unmold. There is no special technique to unmold the cake, I simply run the knife around the inside of the pan and also the center core, then remove the cake and run the knife along the base of the pan to remove the cake. I will try to slide the knife as close to the sides of the pan to avoid slicing into the cake. I think you also do the same thing right? Hi kokken69, I liked to use recipes from Japanese authors too! I find their recipes very reliable. I have something for you. Please come and visit my blog. I havent heard of the tea but the chiffon certainly looks light and fluffy! I can't unmould my Chiffon as nicely as you. So sometimes I actually prefer to bake it till just nice so that it will drop out of my pan by itself! Lol...don't ask me how to know when it's just nice, coz it just depends on my luck. :P It happened again recently for my Chocolate Chiffon (which I can't post now as PC monitor is spoilt again). I would really love to meet you up one of these days. Can contact me? I love this cake! I can already imagine the vivid flavours if it. Thanks for sharing! It's still in its early stages, I would love it if you would like to take part in Bake The World Happy by becoming a member. Please help me pass on the message to others who might be interested. Hi Kokken69, thanks for the tip! I am not too concerned about it. The exterior of the chiffon cake is not crusty, it is actually quite soft. I doubt I will be able to scrape it away as it it also quite thin. Just want to share with you my orange chiffon cake. My texture looks different than yours, holes smaller. Maybe u'd want to have a look? I couldn't help but commenting - your blog is fantastic ! However, I really want to give you a tip for not turning out chiffon cake with big air bubbles in the slice. When you decide to transfer the cake batter into the cake pan, try doing it as a ribbon flowing and after you have poured the batter, try shaking the pan a bit, a few times, but gently. Then place it on a counter or table and knock it a few times. That should help any trapped air bubbles to surface. Please try this and let me know what you get. Again, congratulations for the blog ! I'd encounter this problem before it is due to under beat of the egg white. I tried many times making chiffon, but there was dense layer at the bottom, later I realised that beating egg white for awhile more(hold whisker upside down and the egg white must be stand firm) but do not over beat egg white or else the chiffon cake will be abit dry and cake texture will be rough. Now my chiffon cake texture was prefect and my family and my boss like it very much. I hope you won't mind me for telling you my experience to you. Tks. I love your all your chiffon cakes especially the side of your cakes are evenly baked brown, which you described as "covered with pork floss". May I ask where did you buy your chiffon tube pan - is it in Singapore or on-line shops? All my chiffon cakes are skinless on the side - very ugly for presentation. Thanks lot for your time to reply me. Hi, I got the pan from Phoon Huat. Why some chiffon cake recipes call for cream of tartar but yours don't? Please share. Thanks! hi Yvonne, I am no veteran! I still do not know when exactly I should stop beating the egg whites when making a chiffon cake! Cream of tartar is used to help stablise the egg whites. I prefer to follow recipes that use as little addictive as possible. count me as your new avid fan, discovering your site is like discovering a treasure out in the wilderness! been searching for sound, reliable recipes using small baking pans, i live in a country where baking pans sold are of small sizes though i have huge ones good for parties, but its just me, hubby and my son most of the time, having found your sight is like a wish upon a star granted!! Hi, I am comparing your Yuzu chiffon cake recipe with the lemon recipe and realised you have used cake flour for lemon and plain flour for Yuzu. Why is that so? My Frustration - Finally Over!